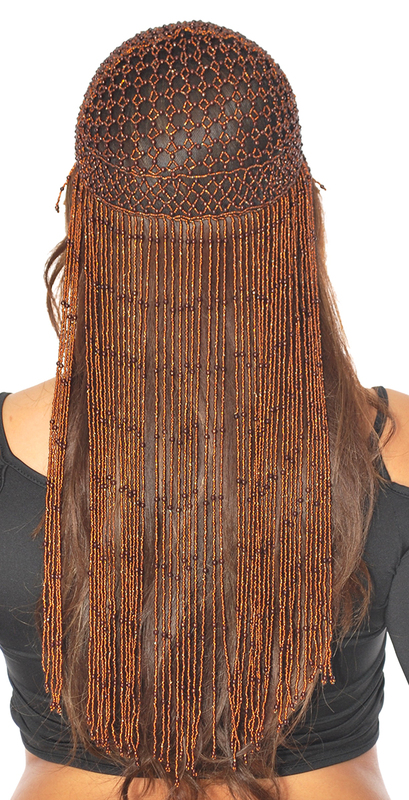 Cleopatra style headdress made from copper beaded fringe on a black base. Great for stage or parties, this Cleopatra style headdress made from copper beaded fringe on a black base makes the perfect accompaniment to a belly dance costume, ancient Egyptian costume (Isis, Nefertiti, Cleopatra, etc), Halloween, and more. One size fits most: Up to (approximately) 23 inches. Long beaded fringe hangs approx. 16.5 inches from cap. Short bang fringe hangs approx 2 inches from cap.